When BlackBerry revealed its new operating software last year alongside the BlackBerry Z10, it was met with mixed responses. The absence of the physical QWERTY keyboard that's BlackBerry's trademark from the first model irked some. And this big-screen model is also an all-touch device. Mind you, so are all its rivals, such as the Samsung Galaxy Note 3 and the Nokia Lumia 625. The Z30 isn't the slimmest smartphone available but it's a good fit in the hand, thanks to the curved-edge back and screen that goes almost to the limits of the phone's front: the phone measures 140.7 x 72 x 9.4 mm. It's not as light as some rivals, either, at 170g, but it's solid rather than heavy. It looks classy - BlackBerry always pays close attention to using the right materials. Beneath the screen the otherwise black front has a silver strip that looks decent enough and the back features the same glass weave as the BlackBerry Q10. This is smooth to the touch, lightweight and good at letting the phone signal in and out easily. This is a well-built phone. It's not a unibody - the back cover flips off - though the battery is sealed in, unlike some BlackBerry models where the need to satisfy a power user who wants to swap one battery for another is paramount. But the build quality makes it feel as creak-free as a unibody design. It feels much classier than the smaller-screened Z10. BlackBerry 10 is an impressive operating system - strikingly different from Android or iOS, but quickly easy to understand. This is the latest edition, version 10.2. As before, the Hub is the heart of the OS, neatly collecting all your emails, social networks and appointments together in a highly accessible way. It's reached by a distinctive up-and-right gesture. And the system has some appealing elements: for instance, you can wake the screen by stroking it - much more intimate than the double-tap, home button-press or other systems favoured by rival phones. Like the Z10, the keyboard here is onscreen only, though it's designed to resemble the physical keys of the Q10, guitar frets between lines of letters and all. The predictive text system suggests words before you start typing the first letter, with revised suggestions as you go. It works well and you can type at speed. There's one issue with earlier BlackBerry 10 handsets that still hasn't been fixed, though - the lack of apps. When the system started it began from scratch as earlier BlackBerry systems weren't compatible. Things started well, quickly topping 100,000 apps, but the store is still lacking many key name apps and is still only a fraction of the million apps available for Android and iOS. It's not that any user is ever going to get to grips with a million apps, but the absence of some big names continues to make BlackBerry less appealing. The five-inch display here is bigger than on previous BlackBerry handsets. It looks great, even though with a resolution of 720 x 1,280 pixels, it's no match for phones like the Samsung Galaxy S5 with their 1,080 x 1,920 screens. As a result, the pixels per inch measurement clocks in at 294, less than the iPhone 5s with its 326ppi or the 432ppi of the Samsung Galaxy S5. For all that, this is a sharp, bright screen. It uses Super AMOLED technology but it avoids the over-saturated colours some phones suffer from..
BlackBerry is mostly known for its business chops, though when BB10 was announced the company made clear that this was a system with features for all customers. This phone has an 8MP rear camera and BlackBerry's speciality, TimeShift. Other phone cameras have this feature or something similar but it's very neatly presented here. The phone takes a bunch of images in quick succession and you can combine parts of the images to make the perfect photo. So if one person's blinking in image 1 but it's the only good take of another person, you can match the best faces from each for the ideal composite. There are more settings and features, plus a competent video mode. This is not the most advanced camera on a smartphone but it's pretty good and very easy to use. The Qualcomm MSM8960T Pro Snapdragon processor at the heart of this phone is pretty nippy - it's a dual-core 1.7GHz model so on paper it's been trounced by many rivals, but in practice it works well. There's 2GB of RAM to help things move at speed. BlackBerry prides itself on being an OS that keeps multiple programs running fully even when they're out of sight and there's no lag, no slowdown. So although other phones boast faster processors with extra cores, this is perfectly well suited to the needs of this phone. The user interface is nippy and responsive, again with no apparent lag. You'd better hope the battery on this phone is up to the task as you can't swap in a spare. This is a departure from most earlier BlackBerry handsets and a surprise given the BlackBerry ethos of needing to serve the power user. But in fact, there's no need to worry - the 2,880 mAh battery is enough to keep you going through a whole day with ease. BlackBerry quotes 18 hours and this seems realistic in practice. 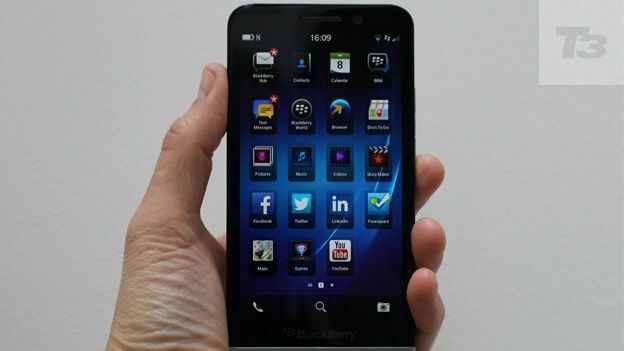 The BlackBerry Z30 is a big but beautiful handset that improves greatly on the first phone, the Z10. If you aren't after a physical keyboard, this is definitely the model to go for: the screen real estate makes web browsing a joy and the phone's speedy performance and solid battery life make it as usable as any other smartphone out there. The BB10 operating system is different from rivals, though certainly easy to use and quickly intuitive. But it still lacks the superbly well-stocked app stores boasted by Apple and Android phones. Still, if the ones you like are there, they work as well as on rival platforms and the central Hub often means it's easier and quicker to find the latest social networking updates, say, than on rivals. BlackBerry isn't the power it once was, but despite the most negative of doomsayers, it's not down and out, either. This is arguably its most forward-looking and attractive handset and is powerful and handsome enough to hold its own.